How to enjoy beautiful and healthy hair? Corn Oil comes forward. Corn oil is extracted from the germ of corn through cold pressing. It belongs to the group of drying oils. Natural and original product has an orange or red shade. A refined one has a golden or yellow colour. 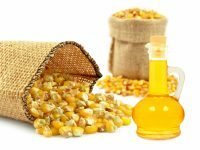 Like any ecological conditioning product, corn oil also has to be stored in proper conditions: dark glass bottle, far from light and dampness. Many people confirm beneficial influence that corn oil has on our organism. Probably it is connected with its ingredients as it contains lots of vitamins, minerals and fatty acids. The oil contains i.e. : vitamins (A, B, C, D, E, K), minerals (potassium, selenium, zinc, sodium, iodine, calcium, phosphorus, manganese, magnesium, iron, copper), fibre, protein and fatty acids (linoleic, oleic, palmitic). Corn oil is used in various areas of life.. Surely, it mostly serves as a seasoning in cooking. It is also used in face and body skin as well as hair and scalp care. Corn oil is recommended for all skin types, ranging from oily, acne-affected, sensitive and allergic to mature, sallow and tired skin. It is also designed for cuticles and nails care. 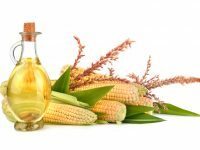 Corn oil is also common in every-day conditioning of hair and scalp. It will work well in hair oiling, in form of a mask or added to a conditioner. 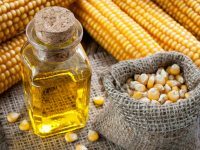 How does corn oil influence hair? It affects its condition both inside and outside. It improves blood circulation in scalp cells, ventilizes hair bulbs, speeds up the absorption of nutritional ingredients. Also, the oil strengthens both hair and hair follicles, making it healthier and more beautiful day by day. It hinders dandruff, nullifies feeling of itching and deals quite well with conditions of the scalp. It regenerates epidermis cells, alleviates irritation and deeply moisturizes. It prevents hair loss and interestingly it stimulates its growth and limits ageing processes of the scalp. 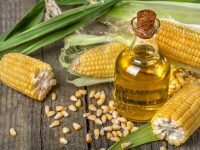 How to apply corn oil to have beautiful and healthy hair? The product will absorb more quickly if we heat it up before the application. We rub the warm (not hot) liquid into the scalp and massage gently. Then, we spread it on hair; more cosmetic can be rubbed into hair ends. After more or less 15 minutes we wash the oil away with a SLS-free shampoo. We may just as well add a few drops of the oil to a mask, conditioner or other hair care cosmetics that we usually use.